Last week, our Assistant Director Alexander Herman gave a talk at Ryerson University in Toronto, Canada, on the topic of museums, law, ethics, deaccession and restitution. 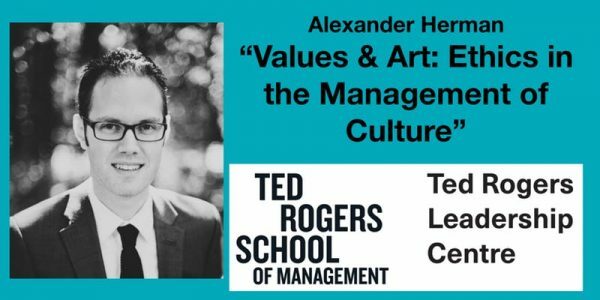 The talk was entitled “Values & Art: Ethics in the Management of Culture” and was part of Ryerson’s Business Ethics speaker series at the Ted Rogers School of Management. The talk sought to introduce consideration of ethical management of cultural collections (namely, museums and galleries) into the traditional field of business ethics. During the talk, Alex spoke of the ethical considerations that museums must take on board when deciding to remove items from their collections for the purposes of sale (what’s known in the art world as “deaccessioning”). The ethical demands are especially onerous in the case of national collections. In most countries, legislation blocks national collections from ever disposing of items in their collections (or, as in the UK, places severe restrictions on doing so). Considered against this backdrop, the case of the National Gallery of Canada’s attempt to deaccession and then sell a painting by Marc Chagall from its collection last year was considered. Alex’s conclusion during the talk, which expanded on his editorial in The Globe and Mail from last April, was that while the move by the Gallery may have been legally permissible under Canada’s lax legislation (the Museums Act of 1990), there were some major ethical shortcomings, especially on the question of transparency – or lack thereof – throughout the process. Next, the talk switched gears to discuss the challenges of restitution and repatriation of cultural material, which also bring up important ethical considerations. Since most European countries place legal bars on deaccession, returning collection items to an individual or group can be difficult, even when there’s a strong moral case for doing so. For examples, you can consider the UK case involving the 2005 restitution request for four Old Master drawings in the British Museum’s collection (Attorney General v Trustees of the British Museum) and in France the case of the preserved Maori head returned in 2010 from the museum in Rouen to New Zealand (written about in Heritage, Ancestry and Law). In Canada, there are no similar restrictions on deaccession for national institutions, so restitution requests are much easier to comply with. As a result, Canadian museums have been engaged in restitution with indigenous First Nations groups in Canada for well over a generation, since there are no legal impediments for doing so. Overall, the talk was able to show that with lax legislation in Canada, the ethical standards on national institutions become that much more demanding. If the law permits a range of action, Alex concluded, then the moral weight of each of those actions needs to be given serious consideration by the relevant institution. For national institutions, the bar will inevitably be high – since they represent national public collections. For more information on upcoming IAL events, in the UK and abroad, see our Upcoming Events page. This entry was posted in Canada, Conferences, Museums, Repatriation, Restitution, Uncategorized and tagged Alex Herman, alexander herman, chagall, deaccession, dispose, ethics, ethics series, law, lecture, lectures, national gallery, ngc, repatriation, restitution, return, ryerson, sale, sell, talks, ted rogers, toronto on March 13, 2019 by Kiri Cragin Folwell.